Few things are more hypocritical than San Francisco’s cavalier attitude toward water. It’s 2012, and yet the ostensibly progressive city has no water-recycling program. That’s right, none. By contrast, Orange County, that bastion of liberalism, recycles 92 million gallons of water a day. San Francisco also has no system for capturing and using the twenty inches of rain that falls on the city each year, even though that rainfall equals roughly half of the city’s annual water needs. Instead, nearly all of San Francisco’s rainwater ends up in the city’s sewage system, treated with chemicals and flushed into the bay and the Pacific Ocean. In short, San Francisco, a city that prides itself on being among the most ecologically conscious places on Earth, wastes huge amounts of water every year, and has no plans to do anything about it. In order to maintain this incredibly wasteful habit, and keep its collective head planted firmly in the sand, San Francisco also continues to act as if one of the most egregious environmental offenses of the 20th Century was no big deal. It's as if the destruction of a magnificent valley in Yosemite National Park, a place that John Muir fought tirelessly to save, never occurred. 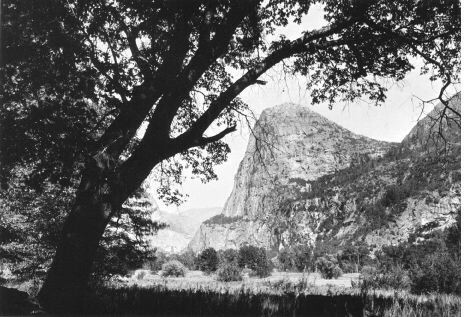 Hetch Hetchy valley before it was flooded. But it did, of course. And it wrecked the wondrous Hetch Hetchy Valley, along with it’s towering waterfalls that cascade down canyon walls, in order to make way for O’Shaughnessy Dam and the massive reservoir behind it. One environmental group, Restore Hetch Hetchy, is trying to finally give San Francisco a conscience, and put an end to the hypocrisy. Last week, the group announced that its collecting signatures for a November ballot measure that would require the city to develop a comprehensive plan for recycling water, capturing rainwater runoff, and examining whether it makes sense to finally drain Hetch Hetchy reservoir and allow nature to restore one of the most beautiful valleys on the planet to its original glory. Although the ballot measure merely requires San Francisco to devise a comprehensive water conservation plan — and does not require that Hetch Hetchy be restored (a separate ballot measure is planned for that issue in 2016) — the proposal is already being met with derision and hyperbole from the city’s establishment. The San Francisco Chronicle ridiculed the proposal in an editorial, while Mayor Ed Lee told the Chron that it was “insane” and “a stupid idea.” US Senator Dianne Feinstein also has made it clear that she opposes any proposal — now matter how reasonable — that could result in the restoration of Hetch Hetchy. One of the biggest misnomers about the ballot proposal and the potential draining of O’Shaughnessy Dam is that San Francisco will lose its water rights on the Tuolumne River, which runs through Hetch Hetchy and feeds the reservoir. That’s false. The 2012 ballot measure will have no impact whatsoever on the San Francisco’s rights to Tuolumne River water. Moreover, even if O’Shaughnessy is drained, San Francisco will still maintain its Tuolumne River rights, and so San Franciscans will still be drinking Tuolumne River water. If O’Shaughnessy is drained, then Restore Hetch Hetchy proposes that Don Pedro reservoir, downstream from O’Shaughnessy, be expanded to handle more water. Another idea is for San Francisco to begin storing water in underground aquifers in the Central Valley, said Spreck Rosecrans, also of Restore Hetch Hetchy, and formally of the Environmental Defense Fund. Other ideas include expanding Calaveras reservoir in Sunol, which is also owned the City of San Francisco, or participating in the expansion of Los Vaqueros reservoir in eastern Contra Costa County. But does it? According to data collected by Restore Hetch Hetchy, the incident rate of giardia — a pathogen commonly found in rivers and reservoirs — among San Francisco residents is 370 percent higher than state average. The San Francisco Public Health Department warns residents with compromised immune systems to consult a doctor prior to drinking the city’s tap water. In other words, maybe its time for San Francisco to start filtering its water, and if it does so, then why does it need O’Shaughnessy dam? It’s also time for San Franciscans to end their hypocritical stance toward water. You can’t call yourself an environmentalist if you refuse to recycle water or capture rainwater. You also can’t call yourself an environmentalist when your drinking water supply depends on the only dam ever built in a national park.